With the recent cold temperatures, it makes you wonder how Minnesota residents ever got through the winter hundreds or even thousands of years ago. For Minnesota's native peoples, the trouble with the long winter months was not only fighting the cold, but fighting boredom. For the cold they had leather tipis, warm fires and rabbit-fur mittens. And when it came to staving off boredom, Minnesota winters were perfect for tossing snow snakes. Spicer, Minn. — Minnesota's Ojibwe did it. The Sioux did it too. In fact the game of snow snakes seems to unite America's native peoples like few other cultural phenomena. Variations were played by tribes from modern-day Maine to Oklahoma to Montana. Anywhere there's snow, ice, and something to throw. In the upper midwest the medium of choice was wood, though some Sioux are known to have used bone with feathers trailing behind for decoration. The object is distance: How far can you slide a stick along the snow? Imagine a combination of curling and the javelin toss, done underhand. Snow snakes historically varied from six inches, also known as "snow darts," to nine or 10 feet. On a recent weekend on a pond near Spicer, the Prairie Woods Environmental Learning Center revived the game for young visitors. Most are throwing specially carved snakes of about two or three feet down marked alleys. Education coordinator Becca Cosner says they're learning that finesse is more important than power. "People who are using a lot of force, it just take a right turn and goes out of the trough," she said. Indian tribes around the continent customized their snow snake tracks. Some built up a jump at the beginning, or snow barriers for the snakes to break through. This year's weather has left the Learning Center with flat ice, which breaks somewhat with the local Chippewa and Sioux tradition. "I know that they used more of a trough with higher sides, so it's almost like the snake could luge along the iced edges," Cosner said. "But we can't do that because we don't have enough snow. So we'll be more creative next year when we hopefully have more snow." For Indians the snow snake was a piece of customized equipment, decorated and tricked-out according to the whims of its owner. Up the hill from the pond eight-year-old Matthew Smith is sanding down and decorating the snake he picked out. "I put my name on it in a couple colors," he said. "And I put a coat of wax on the bottom to make it go faster on the ice." The resident snow snake expert here is volunteer Ben Thoma. Thoma uses ice chips to build snow snake troughs in the summer for kids at Itasca State Park. "We started doing this because it gives them some history of native Americans, gives them something to do, and it's totally noncompetitive," Thoma said. "If you're the best athlete in high school, you might be the lousiest snow snake thrower." There are still small pockets of interest in competitive snow snakes. But by and large the tradition is kept alive by non-tribal interests like nature centers and state parks. Mille Lacs Band Tribal Elder Jim Clark last remembers playing with snow snakes in 1928, and hasn't seen them since. "I don't see kids playing out in the snow (any) more," said Clark. "Too many snowmobiles. All that stuff is dying out on account of the technology today. When I was a kid if we wanted to play with something we either had to make something or have somebody make it for us." Clark remembers using a snake of heavy maple, about 18 inches long. 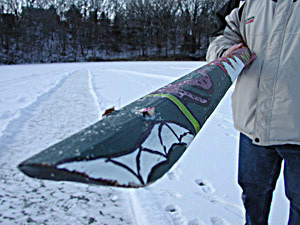 A razor-thin tail cut into the snow, ensuring the broad head stayed on top. "Even if you goofed and threw it under the snow, it would crawl back up to the top," he said. Snow snakes was largely a children's game, but Clark recalls adults going to competitions. Back in Spicer, Joel Osment was inspired to spend an evening in the workshop with his cousin Landon Peterson, crafting their own brightly colored, eight-foot snow snake, complete with vicious teeth and protruding eyeballs. Among the small group out on the mill pond, it appears that size matters. Amid the clattering of the children's smaller snakes, Osment's giant lands with a "whack" and slides across the frozen lake. "We went with kind of the philosophy or idea of a totem pole, I guess, when we came up with our color scheme," Osment said. "We brainstormed different ideas as far as friction, and decided to hollow out the center. We burned and waxed both the rails to reduce the friction and make it go farther." Osment says they may have gone a bit overboard. Nothing wrong with that; whether it's 2003 or 1803, Minnesotans need some way to pass the time in January.